Collecting various knifes for cooking, hunting and fishing has become sort of a hobby for me since the past couple of months. It is a very real thing with multiple forums and groups dedicated to the niche. However, since I am a recent addition to this category, I asked around for objective reviews before I started expanding my collection on pocket knives. Right off the bat, I got some serious raves about a few brands in the industry, which has garnered total support from their audiences. Acting on these reviews, I just bought the SpydercoDelica 4 this month. Since, I believe in extending my experience for the next enthusiast looking to expand their collections – here is an honest review on the performance of the product. The company was founded by Sal Gresser (established the first business in 1976). The very first product produced was the Portable Hand which was kind of spider shaped structure with various angle series and alligator clips to help jewelers and people working with finer parts. However, since 1978, the company started producing knife sharpeners and folding knife series. The CO1 worker was the first folding knife from Spyderco, which made a mark on the target audiences. The company is renowned for various designs and blade steel varieties used for their folding knives. The company also has two patented locking mechanisms to its name. The brand has also produced fixed lade series of their audiences. The unique style of the brand is their specialty knives, which might have plain edges, serrated edges – partial or full (Spyder edge configuration). The fiberglass-reinforced nylon is the most common material used for the knife handles under this brand. 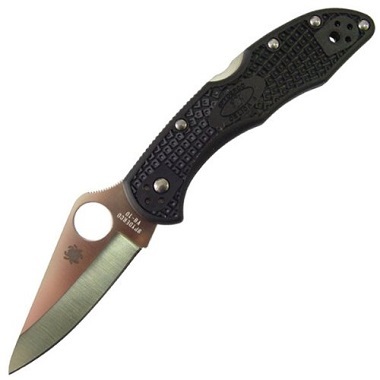 The SpydercoDelica 4 is a unique product with specialty features associated with the brand. The product comes with a four- way clip and screwed together structural design. The skeletonised liners and phosphor bronze washers give the product a raw look specifically associated with the brand. The Delica and Endura series were introduced in the 1990 under the Spyderco name. The knives were first of their kind in the contemporary market. They have been refined ever since and under the Spyderco CQI (constant quality improvement) theme, they have only been improved for the best. The Delica 4 model has the best features yet with screw constriction that makes handling and cleaning the product much easier. The unique branded FRN handles have a bi-directional texturing, which improves traction while handling the product. The skeletonised liners make the knife more ergonomic and lighter in weight while adding to its functionality. The knife has been generating rave reviews. Users have expressed some discomfort to introducing the knife blade to oceanic environment. It might rust easily if you are not up to date with your cleaning procedure. However, it is an affordable model for branded quality trust. I have bought it, I am impressed, and I would definitely recommend users to try this knife as a part of their ongoing collections.